It is time for audacity: demand the termination of NAFTA and KORUS. Unfortunately, progressive forces appear content to harp on Trump policies rather than provide leadership in building a class-based movement for real change. Exhibit A: the unwillingness of key US progressive groups to call for the termination of the North American Free Trade Agreement (NAFTA) and the Korea-US Free Trade Agreement (KORUS). President Trump has demanded changes to both agreements and threatened to cancel them if he doesn’t get the changes he wants. He declared NAFTA the worst trade agreement in American history. He called KORUS a “horrible deal” that has left America “destroyed.” Progressives fought hard to stop approval of both NAFTA and KORUS when they were being negotiated, but now that Trump has raised the possibility of their termination, they seem reluctant to take up the demand. In my opinion, that is a big mistake. Take the current NAFTA negotiations. Progressives seem content to criticize Trump’s negotiating process for being nontransparent and negotiating agenda for being too restricted, in particular avoiding change to the Investor-State Dispute System (ISDS). Both true criticisms. But where is the call for actual withdrawal from the agreement? On Sept. 5, the United States, Canada and Mexico finished the second round of talks on renegotiating a new North American Free Trade Agreement. The AFL-CIO laid out 17 ways that NAFTA needs to be improved so that we can have a North American economy that works for families, not just global corporations. So how well are the U.S. negotiators doing at creating a better deal for workers? Not well. Granted, it is early in the process, and we don’t know a lot yet, but that’s part of the problem. Our number one recommendation was that negotiators should be more transparent, most importantly by making public the rules they’re proposing for the new NAFTA. So far, the U.S. negotiators are failing. There has been no improvement in making the process open to the general public. As working people know, if we are not at the table, we are on the menu, so this grade is crucial. In some important areas, the United States has not made proposals, including on labor and tax dodging. In other important areas, such as rules of origin or Buy American, the U.S. proposals are incomplete. Basically, this progress report has a lot of incomplete grades. Is the U.S. team doing well in any areas at all? Well…the positions on enforcement and state-owned enterprises are a good starting point but need to go much further. In sum, the U.S. negotiators need to up their game. If I were still a teacher and the U.S. negotiators were in my class, I’d be calling the parents tonight to work out an improvement plan to make sure they could pass my class. Of course, there is still plenty of time left to bring the grade up, but the question is whether the U.S. negotiators are motivated to improve or whether they just want to keep recycling failed trade ideas that will add up to another pro-corporate, anti-worker deal. The multinational corporations only need to convince the lawyers that a law protecting public health, digital rights or the environment violates their special NAFTA rights. The corporate lawyers’ decisions are not subject to appeal. This focus on the limitations of the process and agenda is problematic for many reasons. One is that the call for reform can quickly become muddied as people struggle to understand the complex legal and technical nature of the agreement’s various chapters and evaluate whether changes that might be proposed will actually improve or worsen the agreement. In this regard, it is possible that a renegotiated NAFTA agreement will actually include changes to the ISDS, ones that were proposed by the Obama administration for the Transpacific Partnership agreement. If that happens, the progressive movement may well find itself divided and unable to communicate a clear position on the agreement’s renewal. An even more important reason that the call for NAFTA reform is problematic is that it encourages people to believe that the US government is capable of representing something called the “national interest” and that it is possible for a “good” agreement to somehow emerge from the negotiations. But really, these are corporate agreements negotiated by a captured state to advance a corporate agenda. In point of fact, if you have a domestic economic agenda that is designed to weaken unions, privatize public services, slash taxes, and deregulate economic activity, like that of the US over the last several decades, then it is almost impossible to have a progressive international economic policy. International policy flows out of domestic policy. Said differently, you can’t have anti-worker domestic policies and hope to tack on a progressive international policy. This means that the progressive movement, anchored by the trade union movement, needs to attack on all fronts in a consistent way, demanding wholesale change in US economic policy by highlighting the integrated and destructive nature of both domestic and international economic policy. Until that happens, we will remain as we are now, in a situation where international economic issues are largely seen as an add on or set of separate issues that are highly technical and largely divorced from what are considered to be the more important domestic challenges. Unfortunately, there has been almost no discussion by the progressive community of the KORUS renegotiation. Public Citizen has been one of the few groups to take the issue on, and it has called for the agreement’s termination, although largely because of the exploding trade imbalance between Korea and the US. It also correctly points out that most Koreans also oppose the agreement. The odds are overwhelming that Trump will not terminate NAFTA or KORUS. Rather it is more likely that the negotiations will end up producing a few minor improvements and several major extensions that will expand corporate power. If we continue to call for reform rather than termination we will again find ourselves on the political sidelines, with working people turning to the mainstream media for analysis and evaluation, where they will receive misleading information on what was negotiated and the consequences of the renegotiated agreements. If we want to build a class movement it is time for us to show leadership. We need to do more than challenge Trump to improve these agreements. We need to demand that he terminate them; we should call his bluff. So, what is holding us back? Three reasons come to mind. The first is that the progressive movement in the US fears being tainted with Trump nationalistic rhetoric. Some activists have told me that the termination of NAFTA to defend US interests will leave Mexico in a bad situation. This belief highlights the desperate need within our movements for more class analysis. The demand for termination is not a demand to defend US interests at the expense of Mexican interests, it is a demand that asserts the rights of workers in the US, Canada, and Mexico against the interests of big capital in all three countries. A second reason is the fear of being labeled a protectionist. Most of the progressive movement has always mistakenly accepted the notion that these agreements are primarily about trade. They are clearly about far more than that. Actually, one could say that one is for fair trade, as most progressive movements like to do, and demonstrate that we could have fairer trade without these agreements. Having allowed successive administrations to cleverly identify these agreements with trade, the progressive movement has undermined its ability to highlight and take-on the broader neoliberal economic agenda that drives and shapes them. These agreements are above all designed to boost capitalist mobility, power, and profits. By making that clear, we can show that our demand for termination is not based on a simple objection to trade, and thus does not represent for a call for protectionism as commonly understood. Rather, our demand is motivated by a determination to refashion our economy and help workers in other countries do the same; demanding an end to NAFTA and KORUS allows us to stand with workers in Canada, Mexico, and Korea who have also suffered as their economies have become more globalized and dominated by global capitalist accumulation dynamics. The final reason, and one rarely voiced, is the fear of the unknown. The media drums into our heads that existing agreements are all that stand in the way of chaos. We are told that the world economy might spiral into depression if NAFTA and KORUS are terminated. That is hooey. If we end these agreements the world will not end. We still have the WTO after all; trade will continue. But we will terminate chapters that encourage deregulation, privatization, monopolization, capital mobility, competition between workers, and union busting. Clearly, we need to strengthen our confidence in the belief that there can be life after capitalism, that we can build movements that have the capacity to restructure economic relationships and patterns of economic activity along more sustainable, solidaristic, egalitarian, and democratic lines. This will never happen if we fear mounting a direct challenge to capitalist imperatives. Trump has given us an incredible opportunity. He has put the issue of termination of existing trade agreements on the political agenda. We need the audacity to seize the moment. Recently, organizers in a number of cities helped to build strong local coalitions which successfully won passage, either though ballot or elected official vote, of measures that improved majority living and working conditions. Examples include higher minimum wages as well as fair scheduling, paid leave, and improved prevailing wage laws. Preemption allows a higher level of government to restrict the power of a lower level of government in areas where it believes that lower level government action conflicts, or might conflict, with its own actions. In terms of state politics, state governments can use preemption to restrict the rights of city governments. But now, as the following figure from the EPI report makes clear, conservative state lawmakers are fighting back, using preemption to restrict local action. 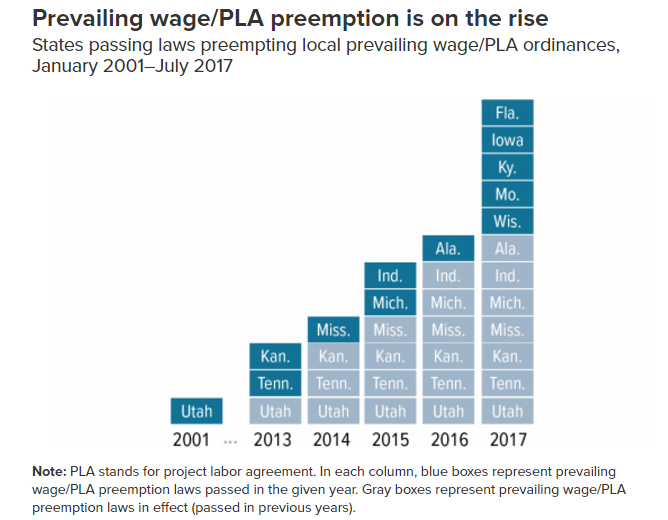 Twenty-five states now have preemption laws denying local governments the right to set their own minimum wages; more than half of these laws were passed beginning in 2013. State level right-wing forces have also taken aim at paid leave laws, which generally include the right to paid sick and family medical leave. There is no federal law guaranteeing workers the right to paid leave, and, as with minimum wage gains, workers have been most successful in winning paid leave at the local level. 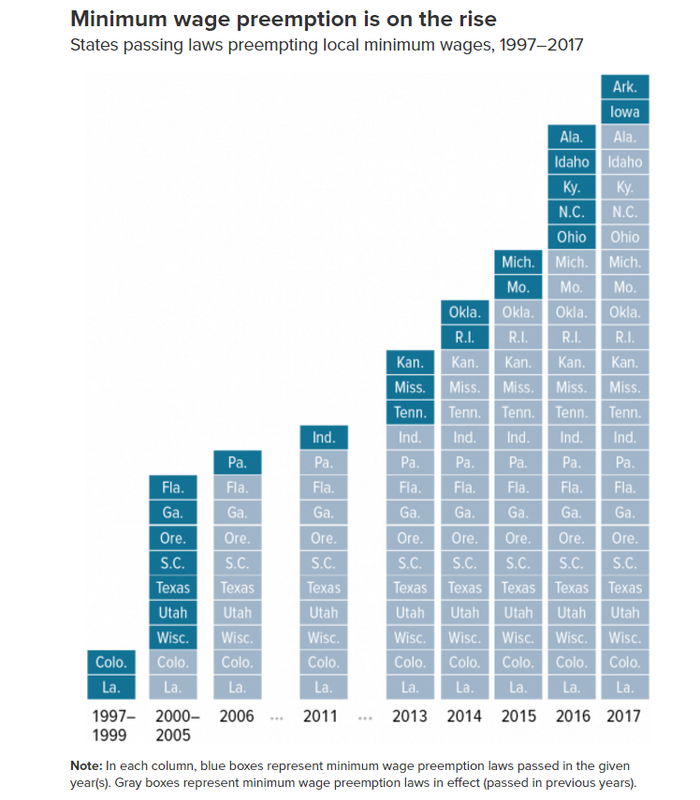 However, as we see in the following figure, state legislatures, since 2013, have been busy denying local governments the right to implement their own higher standards. 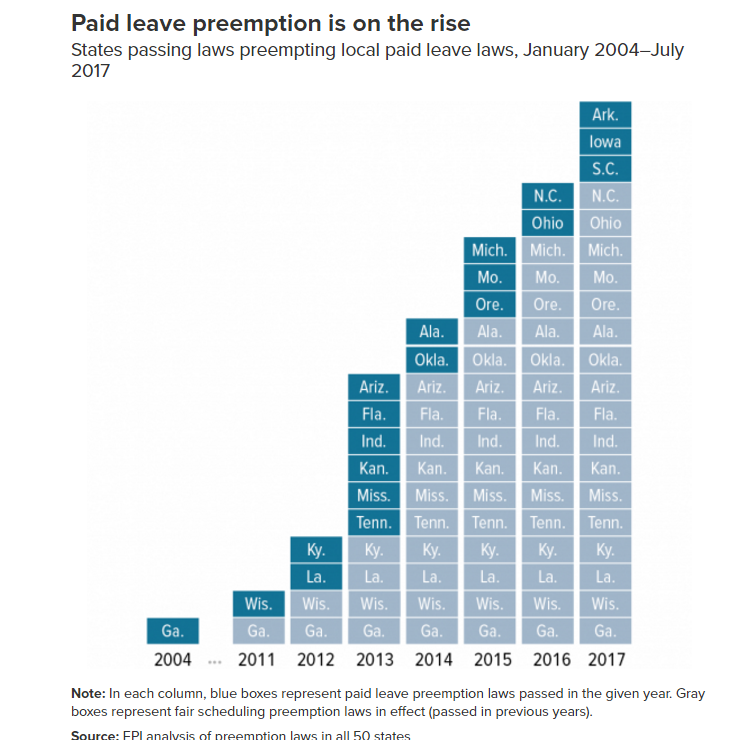 Twenty states now have preemption laws covering paid leave. While waiting for the federal government to act, four cities and two states have passed various forms of fair work schedules legislation. 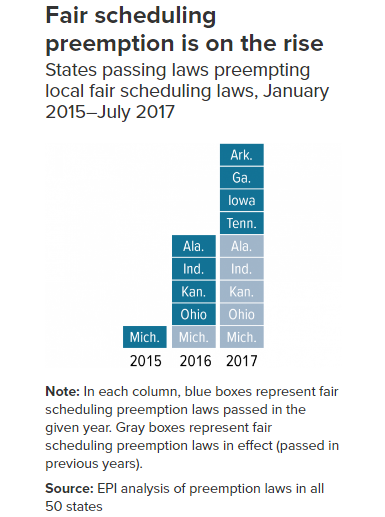 But in the last few years, as local governments have begun to innovate in the arena of fair scheduling, state governments have stripped local governments’ abilities to do so—[as we see in the following figure] at least nine states have passed work scheduling preemption laws since 2015. Prevailing wage and project labor agreements require private contractors to treat workers fairly, including paying all their workers the prevailing wage, when doing work under government contract. Such agreements keep private contractors from competing for public work at the expense of their workers. And, as in the other areas of labor rights discussed above, we see a similar explosion in action by states to restrict the right of their localities to set higher standards for public contracting. At least 12 states now have preemption laws, all but one of which was passed beginning in 2013. The current right-wing strategy highlighted above greatly reduces what working people can win at the city level in many states. Of course, there are still many states where local initiatives can bring real improvement and these should obviously continue. At the same time, it seems clear that the political environment is changing and not for the better in terms of what local efforts can produce. While far from easy, this means that organizers have little choice but to deepen and extend their work. Among other things, this means pursuing efforts to link local/city coalitions in order to strengthen state level influence. It also means that more emphasis needs to be put into building organizations as well as alliances of working people around a vision of good jobs for all, a strong and accountable public sector serving human needs, and healthy cities and communities that is to be won through organizing and direct action as well as electoral work. Above all, this will require seeking and sharing creative ways to strengthen working class solidarity, which is key if we are to overcome the existing divisions that allow right-wing forces to set the terms of our political choices. 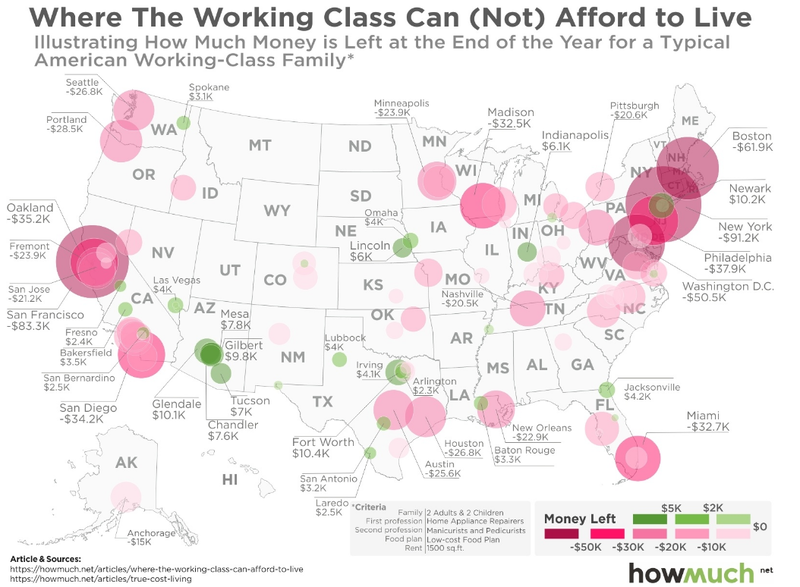 The site defines its typical American working-class family as having four members: two adults (both in their 30s) and two children (ages 4 and 8 years). The adults, who work full-time, have salaries equal to the median city earnings of their assigned professions, home appliance repairer and manicurist. The family lives on a Department of Agriculture low-cost food plan and rents a 1500 square foot apartment. It turns out that in only one of the ten largest American cities would it be possible for a working-class family to enjoy a decent standard of living without taking on debt: San Antonio. Only 12 of the top 50 largest cities would be affordable. Of course, workers can’t run up such debts. So, they do what they have to do to survive—they abandon any hope of having a reasonable standard of living. They move far from their workplace and travel long distances to work, seek additional employment, economize further on meals, place their children in less than ideal day care situations, and crowd into small apartments, all of which take their toll. And with wages continuing to stagnate, the Trump administration determined to slash spending on social services and roll back workplace protections, and a recession looming, the struggle for a decent life is not going to get easier.